The David Neiswanger Building was Building "B" and was opened by the Security Benefit Association on December 1, 1921. The elderly members of SBA were moved from their temporary quarters in the Orphans' Dormitory to Building "B". There were no admissions after 1941 and it was closed in 1954. In 1959, after the Menninger Foundation puchased the SBA complex, the building was air-conditioned and modernized. A 44 car parking lot was built on the SBA tennis courts to the north of the building. 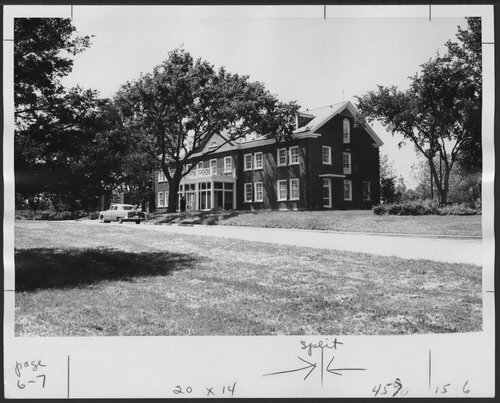 The Department of Industrial Mental Health and the Religion and Psychiatry Training program were moved from the East Campus in December, 1959. In 1960, The building was named to honor Mr. David Neiswanger, the first secretary of the Menninger Sanitarium Corporation in 1925, the President of the Foundation in 1944-1957, and a member of the Board of Trustees for many years. In 1972, the office of the President of The Menninger Foundation and the adminstrative staff of the Division of Preventive Psychiatry were housed here. Later the Topeka Institute of Psychoanalysis had offices at Neiswanger. The Menninger Foundation was located in Topeka, Kansas, from 1925 to 2003 and is now in Houston, Texas.